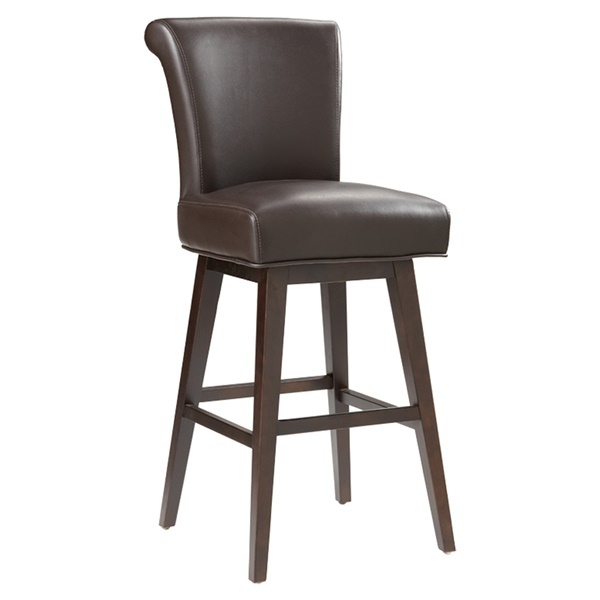 The Hamlet Swivel Counter Stool’s simple, clean lines make it ideal for a contemporary dining area or breakfast nook. This counter-height stool features both a modern look and classic sensibilities, making it both sophisticated and inviting. The Hamlet works equally well in a contemporary space as it is in a transitional one. In addition, understated and neutral styling make it a good fit for any number of different decors. Use it in a home dining space, or at your restaurant counter. This stool’s frame is durably and handsomely crafted from solid wood, with built-in stretchers for added support and stability. The chair swivels for optimum positioning and easy socializing, while thick back and seat padding make it extra supportive and comfortable to. Supple bonded leather upholstery provides a sophisticated and luxurious touch. Choose from several different colors for a look that’s all you.